Hair colourisation always carries certain risk of hair damage, no matter how good is the dye and how many nourishing ingredients will have products after colourisation. With time hair become matte and loose their fresh colour in natural process of scouring the pigment. To meet those problems wants Bumble and Bumble with their Color Minded Sulfate Free Shampoo. What does Bumble and Bumble offer? What are the properties of Color Minded Sulfate Free Shampoo? Color Minded Sulfate Free Shampoo is mainly hair care cosmetic without sulfates. Sulfates in significant way dry out hair and that is what you want to avoid, that is why in Bumble and Bumble cosmetics there are no harmful ingredients. Thanks to such formula shampoo gently washes dyed hair and ensures simultaneous natural pH balance of scalp and hair. 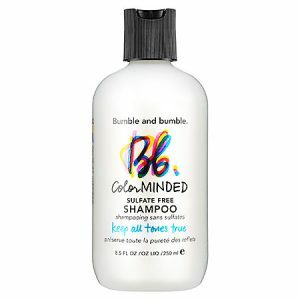 Color Minded Sulfate Free Shampoo from Bumble and Bumble supports colouring preparations and enhances their properties for a long time after colourisation. When dyeing hair, especially with intense colours, it is worth to invest in a product, which will effectively hold colourisation effect and colour will be more fresh for longer. Bumble and Bumble applied in all of their products from this line the complex technology of Colour Protection, which gives guarantee of successful colourisation and lasting colour. By using Color Minded Sulfate Free Shampoo – but also other cosmetics from this line, e.g. conditioner in tube, stylisation preparation and conditioner with UV filter – we provide hair with healthy gloss. Thanks to two polymers, which tighten hair structure, you can avoid discolourations, loss of colour or its matte. Bumble and Bumble Shampoo creates protective film on hair, that prevents colour scouring, but also moisturises and increasingly nourishes cuticles.